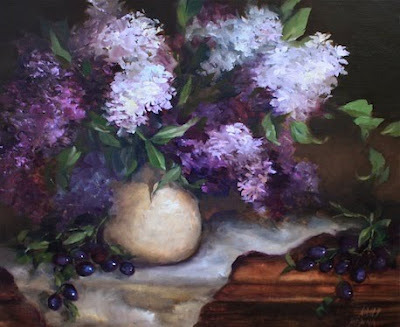 Black Grapes and Purple Lilacs is one of my new recent works that will be appearing in the Daily Painters Gallery tomorrow. 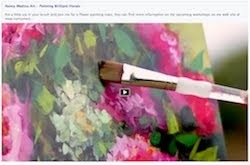 If you have not yet subscribed to the Daily Painters, please take a look at some of these amazing works of art from artists across the country. It was such an honor to learn this week that I am now a part of this talented group. I am still pinching myself a little! A few of my friends who have been on this art journey with me for years have asked how to get in, what is the process. I can share that I applied long ago and read over the site and its requirements carefully. But at the same time, I made a commitment to paint every day and keep working on my skills. I come home after a full day at work as the director of a medical journal in Dallas and I never sit down. 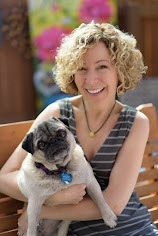 After taking care of the puggies and eating a quick bite, I head straight to the studio, no matter how tired I am, how many conference calls I've had that day, or how much my feet hurt. it also helps to have a supportive husband, plenty of iced tea and caffeinated beverages, and encouraging words from my dear friends like you. I do not know yet if Daily Painters is going to be a huge boost to my art career. But I do know that I am going to keep working very hard on my art, regardless. It is a passion and a calling. Sometimes it feels like this is just the beginning, I have so much more to learn. What a beautiful "Black Grapes and Purple lilacs". You have a passion and you live it. It shows in every painting that you do. The passion is in every beat of your heart. That is why we are drawn to you and your work. Very beautiful, Nancy.I admire your passion. I find art is truly a passion with me as well. A calling? Not too confident of that one with my limited abilities though! LOL Your work is always exquisite, Nancy, and I do so love this painting! hi nancy, it was so nice to visit your blog. great work, ben. 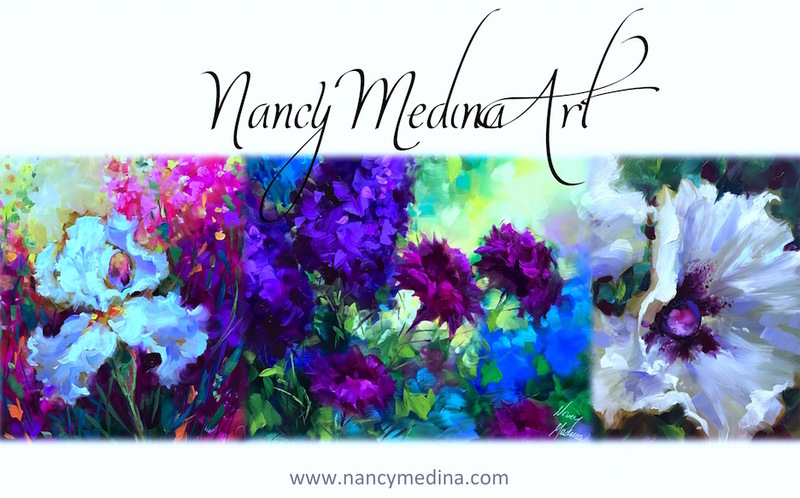 Congratulations Nancy, your inclusion in the Daily Painters is well deserved! I can see the passion in your paintings and I'm sure that's one of the qualities the judges saw when reviewing your work. What wonderful news! congratulations nancy! well deserved! beautiful painting. I truly admire your commitment. I say I'm going to paint after work but always feel too tired. Congrats girlfriend!! All your work is so impressive!! You work hard Nancy!! Thank goodness for iced tea.... I'm with you sister! !